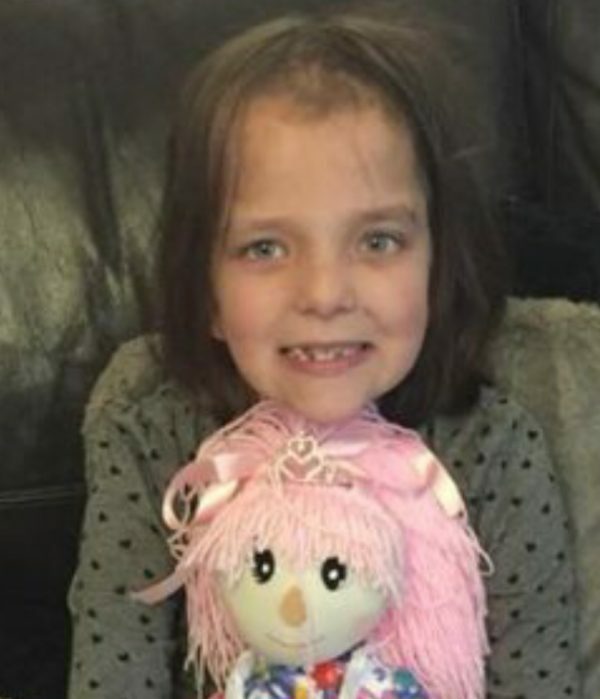 Maddison was diagnosed with neurofibromatosis type 1 in 2013 following treatment for a lazy eye. Her vision deteriorated rapidly at a routine appointment so further tests were done. It was discovered that Maddie had a optic glioma brain tumour: she had 18 months of chemotherapy to shrink the glioma to a manageable size, this was successful and Maddie had been stable for two years. Just before Christmas 2016 Maddie started having seizures, she has never had these before so she went for lots of tests. The results from the MRI on 31st December 2016 originally looked like she had had a stroke. They repeated the MRI on 20th January 2017 expecting the signs of stroke to have decreased but the result showed a small tumour the size of a 5p coin. Doctors were concerned as there were no signs of this on the last MRI. It was decided to re-scan again on 31st January to decide what treatment was needed. We got the results on 2nd February, the results showed the tumour had grown to the size of a plum in 11 days. It was decided there and then to operate on 6th February due to the rapid growth of the tumour and do a biopsy. This operation went ahead and Maddie had a craniotomy and eight long hours of brain surgery to remove as much of the tumour as they could. 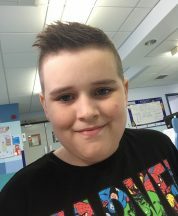 On the 9th Feb a repeat MRI was done to make sure there was no bleeding on the brain following surgery and check how much tumour was removed. On the 10th February we got the results from the biopsy, our world fell apart that day, nothing could have prepared us for the news that came next. Maddie was diagnosed to have glioblastoma multiforme – a rapid growing high grade brain tumour normally found in adults over 50 years old. It’s rare for a child to get this type of cancer, we had to make a decision as there is no cure for this type of cancer and prognosis isn’t great. Without treatment the cancer would rapidly spread to the rest of her brain and within three months it would end her life. The other option is an intense course of radio & chemotherapy every day for six weeks followed by more chemo every fourth week every day for a week. We do not know if this will work, there’s no guarantee that the tumour won’t grow during the treatment, but we are hoping that it will slow the growth down and give us up to 12 months with our precious little girl. Sadly today Maddison passed away. We received Maddie’s MRI results and they showed that the tumour is growing rapidly which explains the constant headache and sickness and the intermittent paralysis down her left hand side. The tumour has started to spread to the right hand side of the brain too now and it will continue to spread at a rapid rate. Glioblastoma Multiforme is one of the worst types of brain cancer due to how rapidly the tumours grow, it’s almost impossible to treat. Now I won’t go into great detail but the prognosis is rubbish I’ve asked questions I shouldn’t have to ask, I’ve been told things no one wants to hear and I’ve had to make the hardest decisions I’ve ever had to make in my life today. We have tried every treatment available to us operations, radiotherapy, chemo, everything, we can’t go for any clinical trials now as the cancer is too far advanced. We have been told to prepare for end of life, we are looking at a few months at most. I’ve been given a prescription to stock us up on pain medication, including morphine. I’ve got to go back in 2 weeks to write up an emergency care treatment plan. And I’ve been told to decide if we want home care, hospice or hospital etc when the time comes. I’ve been told what to expect as the cancer progresses. I’ve written and deleted this post 3/4 times as I just can’t find the right words to type I’m still feeling numb and feeling sick from the hospital visit today. Maddie is really poorly at the moment. Following surgery in December to remove her tumour a 2nd time. We had a scan in February which shows that the tumour has regrown already, the hospital have decided no more treatment will be given to Maddie, we have a scan in 10 days time to see how much more it’s grown. Maddie sleeps a lot now and has lots of headaches, we have been offered palliative care to manage the pain and keep her comfortable. Sadly we think we only have a few months left with her but the results from the scan will give us more of an idea. But we can see her getting worse week by week. Maddie had another 12 hour operation the week before Christmas to try a new procedure to remove as much of her tumour as possible and have glio wafer implants inserted. The glio wafer implants contain chemo which is slowly released directly onto the tumour site. She had a follow up MRI scan on 24th Feb and on the 7th March the hospital consultant called to say that the tumour has started to regrow and this was cause for concern. We are back at the hospital on 13th March to discuss the next course of action by this time our consultant will have had time to liaise with the other specialists to see if there is anything more they can do for Maddison. At the moment we are unsure what could be done next and that is if anything else can be done or if we have exhausted all options and have to let the cancer take its course and she needs to be moved onto palliative care. It’s a difficult time at the moment with the uncertainty of it all hopefully I will have more information next week. Maddie’s Glioblastoma is stable at the moment, she has an MRI scan every eight weeks and chemotherapy for five days every fourth week which can make her feel a bit rubbish and sickly.